Follow us for insight into our crew, contests and giveaways! 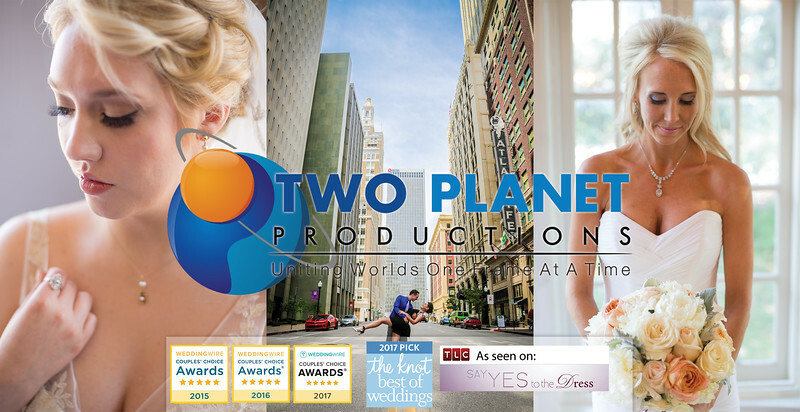 AT TWO PLANET PRODUCTIONS, our mission is to listen to each and every client and find out what the true vision for your special memories are that your wanting to capture. By creating a true relationship, it gives us a common ground and common goals that allows us to create something absolutely unforgettable that we know you will always love because it is based on your vision. We are a team comprised of some of Tulsa Oklahoma's most talented wedding and commercial photographers, videographers and production designers. Combined, we have over 20 years experience in the industry. Besides the most beautiful brides in the world, we have also produced content for commercial businesses and non-profit organizations such as the Tulsa Mayors Office, the Arts & Humanities Council of Tulsa, Tulsa Lifestyle Magazine, Xposure Inc., Rocklahoma and musical acts such as the Deftones, Seether and more. Members of our staff have have taught at ivy league universities and have won multiple awards from the Knot.com, Wedding Wire and were part of the team that was voted People's Choice for best photographers from Tulsa People Magazine 2013. Two Planet Productions remains the most affordable group of fun, professional artists to entrust your life's most precious memories too.